Optimise PV Immersion Control – making use of excess electricity. 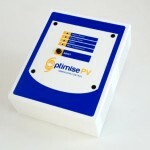 Optimise PV is a cost effective way of utilising excess power from the PV system and converting it to free hot water. LED indicators allow the home owner to know the status of the unit and the boost button allows for an additional over ride if required. OptimisePV is easy to install and the power sensor is easily extendable allowing for maximum flexibility when positioning the unit. Wired and Wireless options available. The Optimise PV Immersion Control is designed and made in Britain – quality and reliability you can depend on.